Santa Clara County is mounting a huge campaign aimed at tackling what some polls indicate is the top concern among residents: affordable housing. The "Yes On A For Affordable Housing" campaign kicks off in Santa Clara County. The start of the campaign season is underway with politicians and political groups launching their best efforts for victories in the November election. NBC Bay Area was at the official "Yes On A For Affordable Housing" campaign kickoff this week in Santa Clara. 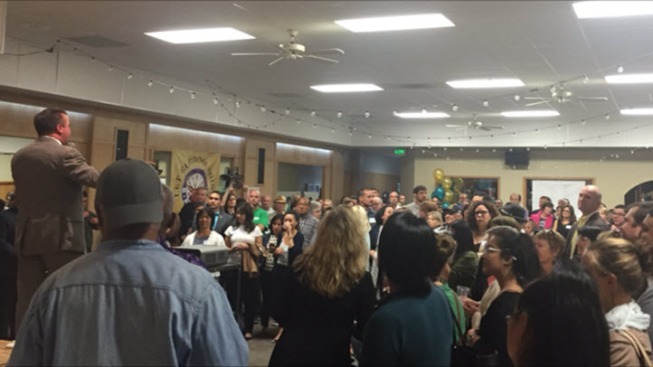 About 300-supporters including leaders from throughout the South Bay jammed the Elks Lodge to launch the move to pass a $950 million affordable housing bond measure. The roomful of supporters cheered loudly as campaign officials announced various goals already reached such as garnering more than one hundred official endorsements and hitting one million dollars fundraising. County Board of Supervisors President David Cortese is the honorary co-chair for the campaign committee. Cortese led off a series of speakers by saying the bond measure is needed to keep families and homegrown talent here. "When we have young, talented people who grew up in this area but are forced to move away because they can't afford housing then we know we have to do something about it." Cortese said. Cortese told NBC Bay Area the bond measure will help address numerous issues. "We have a chance to make history in November with taxpayer support by ending homelessness and creating affordable housing in the wealthiest county in America," Cortese said. "This is by far the most far reaching initiative I have ever been involved with as an elected official." County Supervisor Cindy Chavez, who is also an honorary co-chair, agreed and said those who have been working toward solutions to homelessness require assistance. "Our community needs more and our advocates and service providers need more to work with" Chavez said. $150 million for affordable housing and programs for working families. But the measure requires a two-third voter approval and some critics have expressed skepticism about generating what amounts to a new tax. Some have also questioned whether the taxation is expressed enough on the ballot though officials insist they believe it is clearly laid out. Citing an EMC Research poll conducted in the spring, campaign director Ed McGovern said "We know voters support the measure we need to make sure we reach them."